Family Fun has always been one of my favorite magazines for activities, crafts and kid-friendly recipes, and now I love them just a little bit more. As I fight through day #6 with this nasty flu virus, today’s treat comes to you straight from the editor’s of Family Fun! 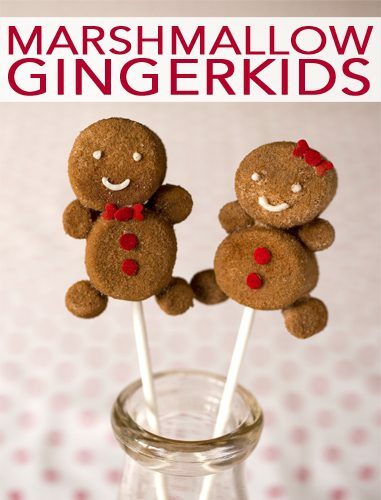 These marshmallow gingerkids are adorable, and I can’t wait to give this a try with the girls once I’m feeling better. I’m also imagining the other fun shapes, characters and flavors you could make with this same process! Combine 1/2 cup sugar with 2 teaspoons cinnamon and 1/2 teaspoons ginger in a medium bowl and set it aside. Fill another medium bowl with water. Set aside. In another bowl, melt 1 cup white chocolate chips according to the package directions, then transfer the chocolate to a Ziploc bag and snip off a corner. To form each pop, slide two marshmallows onto a lollipop stick. Use the melted chocolate to adhere mini marshmallow arms and legs as shown. Let the chocolate set. Dip the pop in the water, then roll it in the sugar mixture until coated. Pipe on a chocolate face, then use more chocolate to attach heart and confetti sprinkle buttons, bows, and bow ties. Brought to you by FamilyFun Magazine.